Yamaha BP-S1065 review | What Hi-Fi? 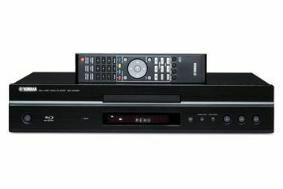 All things being equal, the Yamaha BP-S1065 would be a front-running Blu-ray player. It's built and finished to a standard that entry-level machines can't compete with, and it's got big, bold, thorough on-screen menus. The remote control's hardly the last word in luxury, but it's logical and comprehensive and fairly easy to navigate in the dark even without the aid of backlighting. On-board decoding of high-definition soundtracks to eight-channel analogue outputs will delight the owners of veteran multichannel amplifiers, and while there's no on-board memory for BD-Live content there's a USB socket on the rear for external memory. Performance, too, is not to be sniffed at. Our Avatar Blu-ray looks a treat, combining a lustrous, nuanced colour palette with excellent contrasts and smooth, secure motion-tracking. What's more, the Yamaha's a confident upscaler of DVDs, keeping picture noise to a minimum and retaining much of its poise where movement is concerned. If anything, high-def sound is even more impressive. Subtle and substantial by turns, the BP-S1065 remains controlled at the height of the action but demonstrates a deft lightness of touch when required, and describes a big, solid soundstage. There's a ‘but' coming, of course, and the chances are you know what it is: £460 is a hair-raising amount of money for a Blu-ray player these days. Machines costing a third of that can get close on sound and picture.